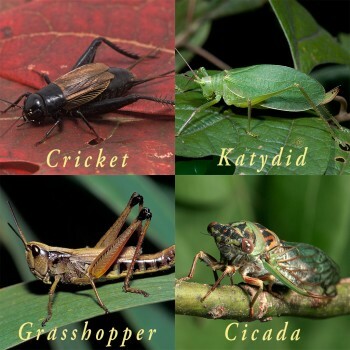 The high-pitched songs of crickets, katydids, grasshoppers, and cicadas are a prominent element of summer and early fall in most of North America. These wonderful musicians chirp, click, zip, rattle, and lisp from trees, shrubs, lawns, fields, woodlands — from just about all habitats, and sometimes from inside our homes. Finding and identifying a singing insect can be a wonderful challenge. These pages will expose you to over 90 common and widespread species and will help you identify many of the singers that you will hear in your immediate surroundings and in the countryside far from home. With the help of a flashlight and considerable patience, you will be able to track down individual singers and perhaps even view a singing performance firsthand! As the frogs and birds grow silent with summer’s bloom, we become aware of the gradually intensifying chorus of the insect tribe — a cacophonous mixture of chirps, trills, ticks, scrapes, shuffles, and buzzes. What a joy to behold these choruses of males, serenading females of their own species until cold weather dampens the chorus and heavy frost finally brings it to a close. A wonderful summer chorus of singing insects as a thunderstorm approaches. ©Wil Hershberger August, 2012. This means our site is judged to be in the top 5% of insect- or nematode-related WWW sites by a committee of professional entomologists and nematologist. 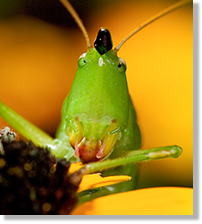 These professionals agreed that our site adds significantly to the knowledge of entomology and nematology on the WWW. There were no significant differences in the pharmacokinetics of alendronate sale glipizide..